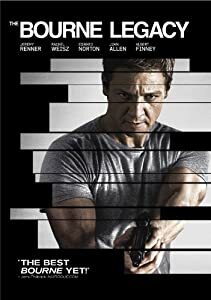 Official Description: The Bourne Legacy takes the action-packed Bourne series to an explosive new level. On the verge of having their conspiracy exposed, members of the government’s intelligence community will stop at nothing to erase all evidence of their top secret programs – even the agents involved. Aaron Cross (Jeremy Renner) must use his genetically-engineered skills to survive the ultimate game of cat-and-mouse and finish what Jason Bourne started. Also starring Academy Award winner Rachel Weisz and Academy Award nominee Edward Norton, critics are calling this a “thrilling, edge-of-your-seat heart-pounder”. Unofficial Description: I have said it before and I’ll say it again; I feel as if Hollywood really wants us to believe that Jeremy Renner is a star and so they keep pushing him in our face. Kinda like Megan Fox. A fan of the Bourne flicks, I really wanted to like this one. I was excited about it. When I had the cash, I snatched up the DVD of it. But it didn’t hook me early on and before I knew it, I was doing other things (like writing blog posts) while it was on. It felt way too long and convoluted. I’m still not sure why Cross was doing what he was doing except that maybe he was a drug addict? Addicted to the drugs they gave him? And his showing up at the doctor’s house when he did was the kind of perfect timing that only happens in a Hollywood movie where things don’t have to make sense. Edward Norton’s character made no sense to me. And the way they were trying to tie this to the previous movies, it was way too forced and weird. I suppose if you’ve never seen the other movies, this one would be okay, not great – but as a part of the whole, this was a very poor offering.